Twenty-three RN-BS nursing students and One Nurse Leader were inducted into the Maria College Omicron Sigma at-Large Chapter at the Charter Amendment Ceremony & Induction event on Friday, November 9, 2018. 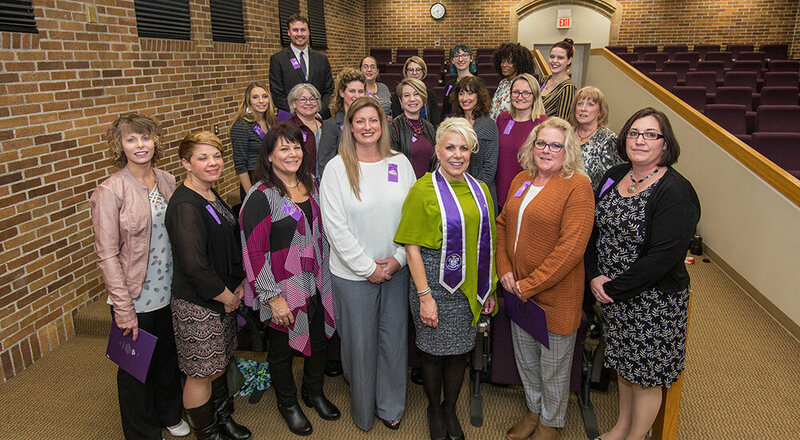 Maria College received the coat-of-arms plaque, making it an official chapter of Sigma Theta Tau International Honor Society of Nursing. The crest on the plaque symbolize the enduring values as a reminder to Maria’s commitment to: Wisdom and discernment, as represented by the eye; Service, professional endeavor, and strength of leadership, as represented by the pillars of stone at the right and left; and Knowledge, as represented by the lamp. Above photo left to right: Jeanne Carfora, BS, RN, Vice President of the Omicron Sigma at-Large Chapter; Ellen J. Argust, MS, RN, CNOR, Director of RN-BS Completion Program; Victoria A. Callagan, EdD, RN, Associate Chair of Nursing for Curriculum; and Laurie Carbo-Porter, PhD, RN, immediate past Secretary of the Sigma International Board of Directors and a Virginia Henderson Fellow. Learn more about the BS Degree in Nursing Completion program at Maria College.